HomeBreed ComparisonLabradoodle vs Goldendoodle: Which Doodle Is Right For Your Family? If you are looking for a low shedding, family friendly dog, you have probably already come across both the Labradoodle and the Goldendoodle. The Labradoodle is a Labrador crossed with a Poodle, whereas the Goldendoodle is a Poodle crossed with a Golden Retriever. Both of these Doodles are wonderful breeds, however there are some differences in their size, temperament and working suitability. We’ve taken a look at some of the similarities and differences between the Labradoodle and the Goldendoodle and laid them out clearly for you to read. In order to choose your perfect best friend, it’s important you really understand the difference between these two breeds. Both dogs are very similar in size with the Goldendoodle usually being slightly smaller. They are both very friendly with other dogs. The Labradoodle and Goldendoodle are great with all people. They are high energy dogs that need plenty of regular exercise. You will find both of these breeds love swimming. With a high level of intelligence you should find them easy to train. Because they are booth half poodle they will shed very little. Goldens are more enthusiastic and excitable. The Goldendoodle’s coat tends to be longer. Labradoodles are more reserved in new situations and with new people. Goldendoodles are more suited to being therapy dogs. Labradoodles are generally more suited to being working retrievers, guide dogs and other more physical types of work. The Goldendoodle is a gorgeous dog that’s extremely popular in the world of designer dogs. This pup has a love for life that is matched only by its parent, the Golden Retriever. It is incredibly friendly, loving and loyal. This is a high energy dog that requires a lot of attention. They will constantly want to be by your side. They have a naturally outgoing demeanor which makes them a friend to all. 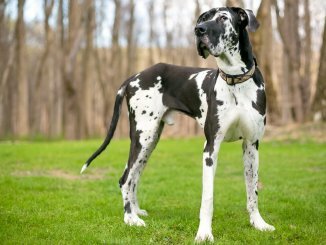 Being extremely high energy, you really need a large yard with one of these dogs. They need to be walked for at least an hour a day. They love hiking, running, swimming and any other type of exercise you can think of. They are best suited to an active family environment where someone is around all the time. If left alone too much she can become quite destructive. This is a highly intelligent breed who needs plenty of mental stimulation. They are a pleasure to train as they only want to please you. You should be careful with how many treats you give them though – they are prone to obesity. They are a wonderful family dog. They are outgoing, playful and a joy to have around but they are a big time commitment. You have to be sure you’re able to provide them with everything they need before taking the leap into ownership. The Goldendoodle is generally between 45 and 80 lbs. They stand at around 13 to 24 inches tall at their withers. Keep in mind this is a Standard variety. Due to the Poodle’s variation in size, Mini Goldendoodles have been bred too. Minis are created when a Golden Retriever is crossed with a Miniature Poodle. They look pretty much the same, but mini! Goldendoodle have a long coat that is generally wavy but is sometimes straight. Their coat will keep growing to around 6 inches if not trimmed. Many owners have regular grooming trips to keep their coats short and manageable. 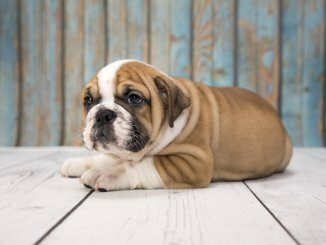 The coat colors you should expect mainly fall in the similar shade range that Golden Retrievers demonstrate; various shades of gold ranging from pale to darker caramels and reds. 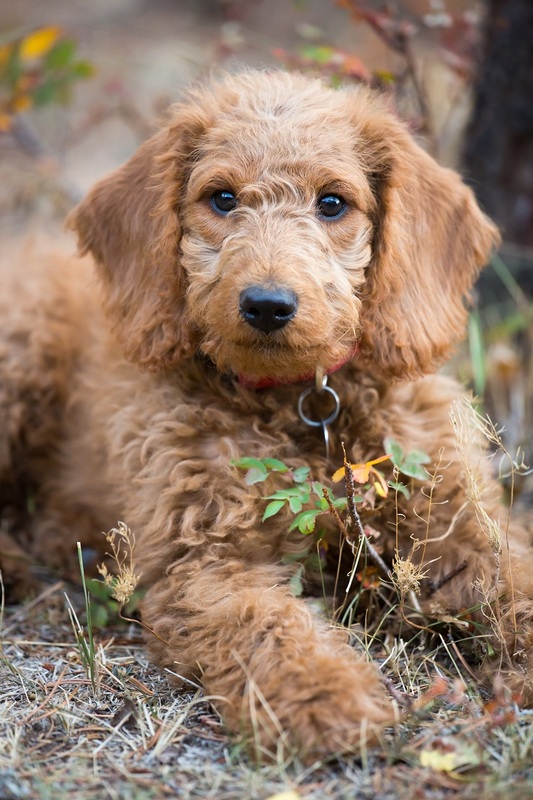 You’re more likely to have a hypoallergenic variety if they’re a second generation cross – this is when a Goldendoodle has been crossed with a Goldendoodle. You couldn’t find a more friendly, affectionate, loving dog than the Goldendoodle. They have a love for life that is infectious. They make everyone around them smile. These dogs love all people and all animals. They are at their happiest when they’re out and about meeting new friends. With children, they have a natural gentleness and patience. They also don’t have much of a hunting instinct and easily make friends with other animals. The flipside of this pure love for people is their hatred for being left alone. If ignored and left without company, she will become depressed and withdrawn – not to mention destructive. When bored, they will chew up anything in sight. What is great about the Goldendoodle is that you can leave them with anyone. If you have to be away for the day and can’t bring them with you, they’re happy to stay with one of your friends! You should always use positive reinforcement when training. They only want to please you and will not respond to punishment or raised voices. She love learning new games – fetch will likely be a staple in your day to day life. Whilst they are not good guard dogs, they are good watchdogs though. They are likely to bark when someone is coming up to the house or if they hear any strange noises. Thanks to their excellent temperament they are regularly used as a therapy dog. A Goldendoodle from a responsible breeder will cost between $1000 to $2500. If a puppy is listed for a much lower price than what you would expect, this is a warning sign. You should be aware that many puppy mills produce Goldendoodles that are poorly bred and unhealthy. When vs a Labradoodle, the Goldendoodle has almost an identical lifespan. A healthy, well-bred Goldendoodle should live for 10 to 15 years. The Labradoodle was originally bred by Wally Conron. He bred them to act as a guide dog for people with allergies. They have since gained in popularity, not just as a working dog but also as a companion animal. Labradoodles are excellent first dogs. They’re easy going, highly trainable and friendly. 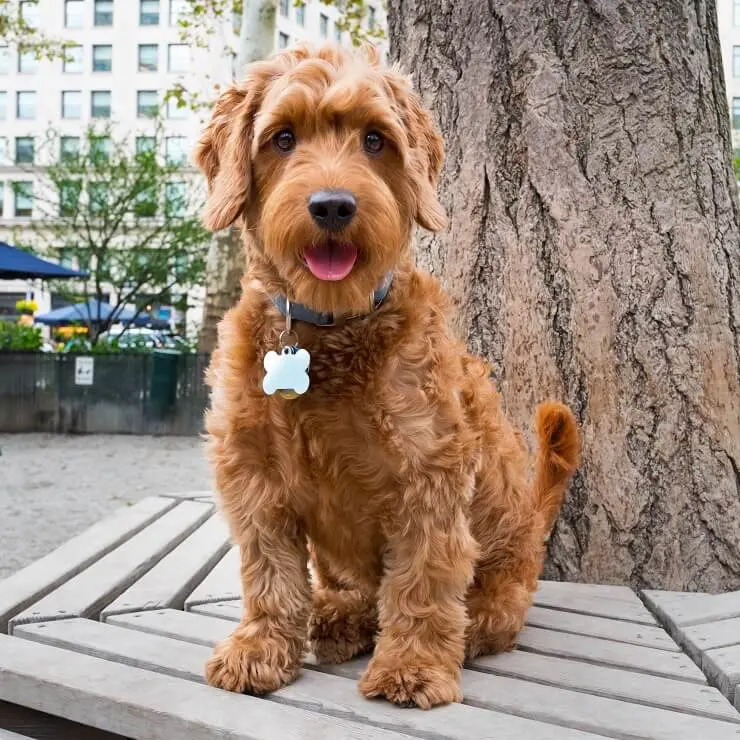 This is an extremely loyal dog that forms strong bonds with their families, much like the Goldendoodle. This breed is well suited to an active household. They love to go out on hikes and long walks. These dogs especially love swimming, much like their Labrador parent. Labradoodles are highly intelligent and respond particularly well to training. If you want a low shedding working dog, the Labradoodle is a good bet. 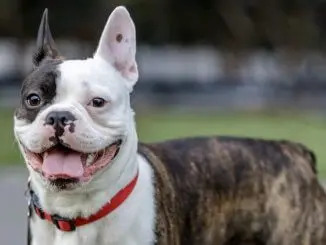 They’ve been used for guide dogs and gun dogs; if you want a working dog, you need to buy from a breeder that specializes in breeding dogs with working characteristics. Labradoodles are hugely loving, friendly dogs but they’re not as quick to trust new people, places and dogs as the Goldendoodle. They’re slightly more reserved. They make excellent family dogs. They’re great with children and other dogs. Sometimes they play pretty roughly which an older dog may not appreciate. This is a breed that takes quite a while to mature and is known to behave in a puppy-like way for a long time. You can expect them to weigh between 45 and 80lbs. They stand between 14 and 24 inches tall. As with Mini Goldendoodles, there are also Mini Labradoodles! They’re simply a smaller version of the Standard one. The Labradoodle’s coat is fairly short and curly. It’s more similar to that of the Standard Poodle than the Labrador and is usually low shedding. 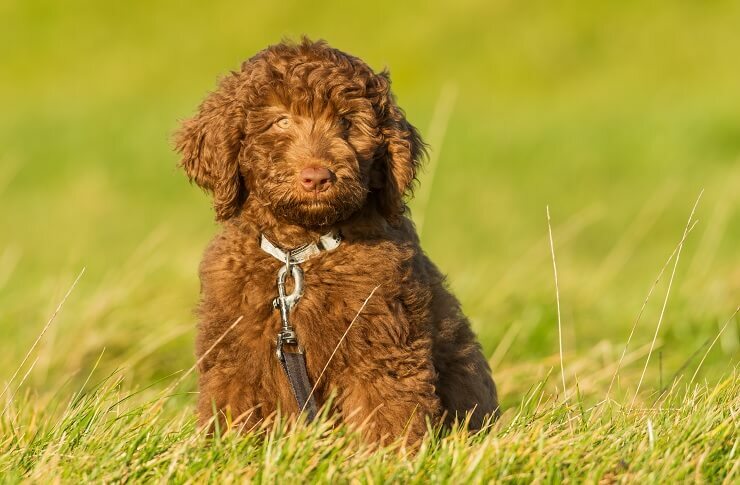 As the Labradoodle is not a standardized breed it’s impossible to predict exactly which characteristics a puppy will inherit from each parent. You can have a Labradoodle that sheds. Their coat colors are much more varied than the Goldendoodle. You will see the traditional Lab colors of black, yellow, and chocolate but you’ll also see other variations. This includes cream, white, and dual and tri-color combinations. Labradors sometimes possess a dilution gene that alters their coat color to be lighter. Make sure to brush your Labradoodle every day to reduce mats and dirt build up. They will also need regular trips to the groomers to be trimmed and washed. The Labradoodle has an excellent temperament. They’re loyal, friendly and loving. They love to play and are happy to spend hours in your yard chasing balls and playing games. A fenced backyard is definitely needed with one of these dogs. They need space to run off their energy. Having all that energy is great, but they need something to direct it towards. Training sessions are a perfect way to burn off some of their energy, bonding with your dog and testing their brains. They need about an hour of exercise every day. They’d be happy to come with you on jogs or bike rides – they just love being out and about. This is another breed whose strong devotion to you makes being apart a difficult time for them. Separation anxiety is common in this breed. If you want to own a Labradoodle, you really need to be around them most of the time or at least arrange for them to have company. 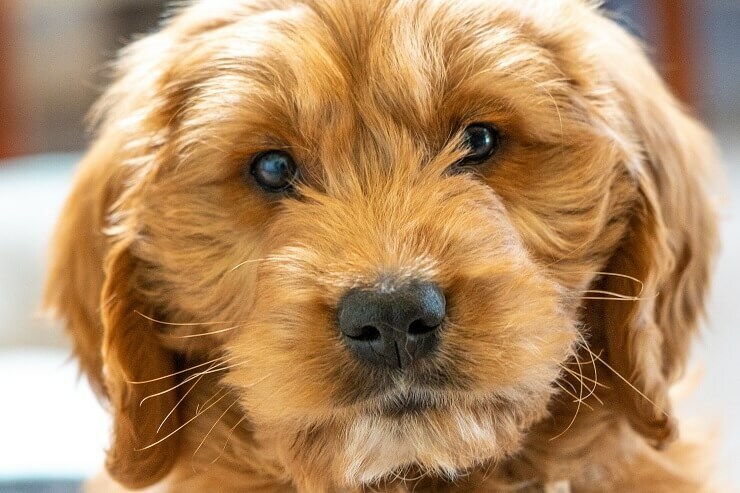 A Labradoodle puppy is going to cost you between $1,000-$3,000. It might be worth checking your local dog shelters for Labradoodles. Having an older dog is much easier than a puppy and generally, it only costs around $250 to adopt. Plus, you’re changing that dog’s life – it’s an extremely rewarding experience. A well cared for Labradoodle will live for around 10 to 15 years. So Goldendoodles vs Labradoodles, which dog sheds more? Both dogs have Poodle parents and have the possibility of being hypoallergenic. This makes them a good option for people with allergies. Neither one sheds more or less than the other. It all depends on whether your particular puppy has inherited the gene. Most puppies are, at the very least, low shedding dogs. They are both loving, friendly, loyal, energetic dogs that adore their family and make amazing pets. The main difference in their temperaments is that the Goldendoodle has more of an unbridled zest for life. They are described as always being happy and excitable. The Labradoodle has a slightly more reserved nature, especially with strangers and strange places. They are much less likely to go running up to people on walks than the Goldendoodle. We’ve let you in on all the important similarities and differences between the Labradoodle and the Goldendoodle. You should now have a good idea about which pup is best suited to your life style. Is it a Goldendoodle with their love of life and people? Or the Labradoodle with their affinity for working? Both dogs require an active lifestyle and plenty of attention! It’s a big commitment to own a dog and you should be ready for all the crazy adventures that come with it. Luckily, when you’re choosing between two such amazing breeds, you really can’t go wrong. No matter which one you pick, you’re certain to be happy with your decision.